Neron Informatics was announced as winner in 'Innovation in Green Telecom' category for their innovation 'Onyx' at the 8th edition of Aegis Graham Bell Award 2017, honoring the best innovation in the ICT domain in India. Neron has been applauded as winner at the 8th edition of Aegis Graham Bell Award at NDMC Convention Center, New Delhi. 3) 3rd Party integration and 4) Business Apps; into a Single working system that can be managed in a friendly manner. The journey of Neron Informatics from being a non entity to a force to reckon within just four months time has been truly exemplary. 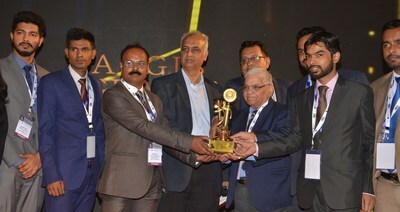 It came into existence in the month of November 2017 and competed in the same month in Aegis Graham Bell Awards Jury round for its Innovations in Green Telecom Category for Onyx cxm IPPBX systems and in Innovative Telecom Product/Solutions for AAIKYA, an automated Telephony system in a box solution. It was not an easy task to compete with the industry bigwigs in the first instance. After an extensive presentation on its innovation in November 2017, Neron Informatics reaps the rewards by bagging the prestigious award for Onyx cxm here in Delhi yesterday. The victory amidst such tough competitions substantiates Neron's efforts in giving the Industry new directions through its innovative solutions and products. Winning the Aegis Graham Bell Award has given Neron Informatics a strong foothold in the Industry. "Getting nominated for Aegis Graham Bell Awards is an incredible honor, particularly when the strength of the competition is so extraordinary. But to win against such strong competition is just amazing. I am humbled, but incredibly proud too. With so many innovations to choose from, the judges must have had an unbelievably difficult job to select the winner and I'd like to thank all of them for recognising the innovations that Neron presented. Every time I look at it, I'll be reminded of this moment and how much it means to me, to us. All said and done, let's not forget that awards are not simply about winners and losers; they tell us a lot about our industry too and as long as there are awards like Aegis Graham Bell around with such competition, we don't need to worry about the future of Telecom Industry. This award I'm accepting for my team/myself/my company and of course on behalf of Telecom Industry. From where we stand, the future of Telecom Industry looks bright," said Mr. Dev Kumar, Chief Technical Officer, Neron Informatics Pvt. Ltd.
About Neron Informatics Pvt. Ltd.
Neron Informatics is a key player in Unified communication Segment of Telecom Industry and specialises in development and implementation of innovative products for telecommunication market in India. Incepted in 2014, under the banner of 'Make in India' programme, it is into manufacturing of State of the Art IPPBX systems besides providing solutions for Network Security & Surveillance and Internet of Things or IOT. The core of this manufacturing has been Neron's expertise in improvising on the existing features that are currently available in the unified communication industry. The company offers a range of products that covers the whole spectrum of SIP and Unified Communication integrated solutions. Our product range comprises of Onyx cxm, a state of the Art IPPBX with Advanced Features and AAIKYA, an Automated Telephony System in a Box Solution. 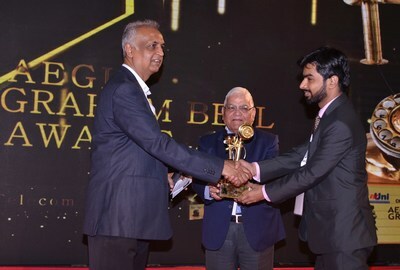 Aegis Graham Bell has been promoting innovations and entrepreneurship in Telecom, Data Science, Smart City Solution, Cyber Security, Digital India, Cloud and Mobility. AGBA has been rewarding those who made outstanding contribution in these fields since 7 years with a vision to foster and stimulate innovators, for India to become a nucleus of innovations. The Award is organized with support of the Cellular Operators Association of India (COAI), and Telecom Centres of Excellence (TCOE), Convergence India and Deloitte as a knowledge partner.